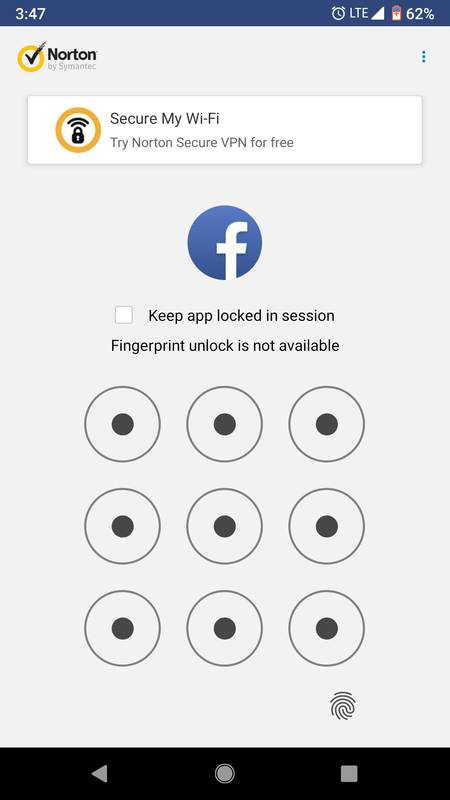 Using android pie I'm unable to unlock the apps using fingerprint most of the times it doesn't respond. Now after the latest update it shows fingerprint not available most of the time when trying to unlock. And what device to you have Android 9 (pie) installed on? Does the finger print access work at all? Is it only on certain sites that you find it not working? I use Pixel 2, Most of the times when i open any app it gives the message you see on the screenshot i'll have to use pattern or pin to unlock it. Few times it works i cant say exactly when it works or it doesn't work. It was working fine with O after updating to Pie having issues in unlocking using fingerprint. Fingerprint works fine i use to unlock my phone verify to pay bills etc so there is nothing wrong with Fingerprint. Seems it may be some issue with Android 9 and App Lock. I'll pass this info along to my Norton contacts. Apparently there is a new version of App Lock being released that resolved some other issues with Android 9 on a Pixel device. Look for version 1.4.0.432. Keep checking if you do not see it yet. I do not see it yet here in Canada. When you do get it, please test to see if you still have the issue with the finger print unlock.